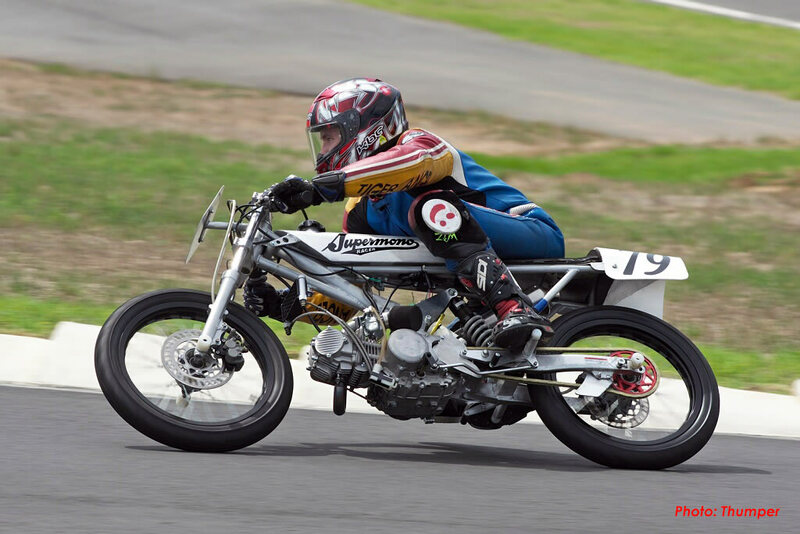 The Supermono race bikes first outing in Motolites on the South Circuit at SMB had a brilliant start finishing 2nd overall with Steve Kairl on board. 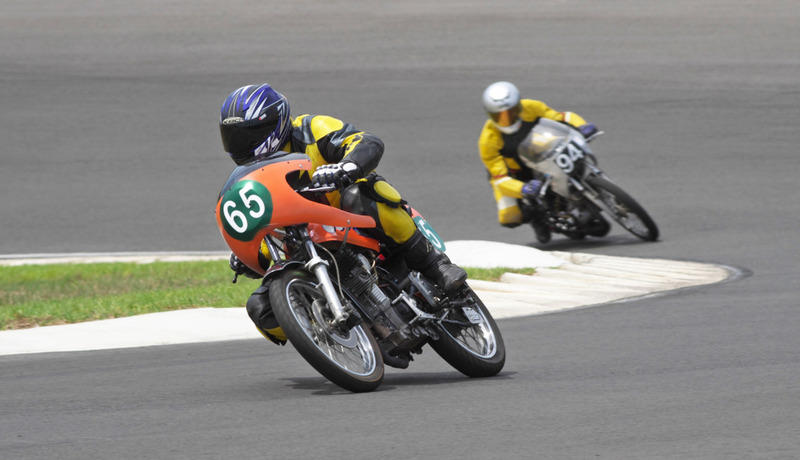 Steve on a 150cc Supermono and Raymond Perez (197 Supermono) fought race long duels with each other and the more established Motolite runners. The Supermono missed out on a double podium when Raymond stopped, out of fuel on the last lap. Some brilliant riding by Steve kept the 150cc Supermono in the hunt to bring it home to a well deserved 2nd place. 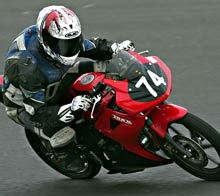 Honda CBR 125 or similar and Race in the Commuterlite Class. 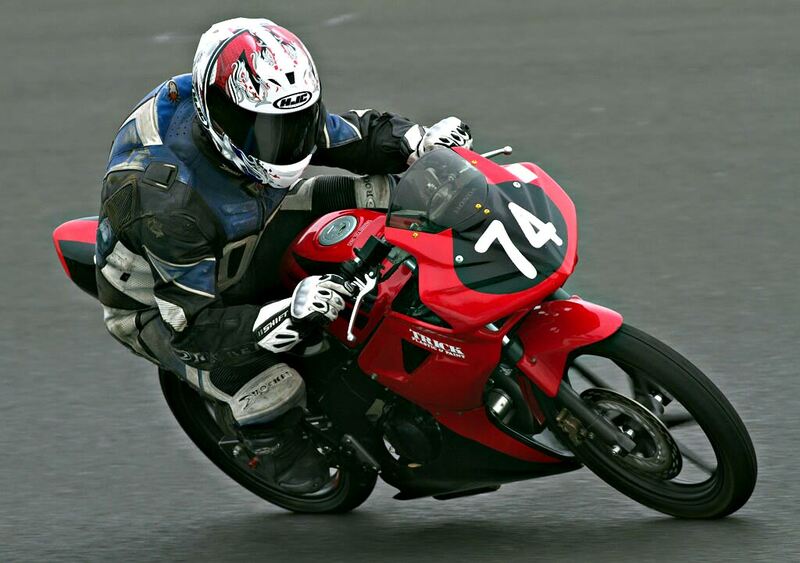 Be like Last Years Champion Ron Carrick and race in the cheapest, fastest growing class in Motorcycle Racing. #74 Ron Carrick teamed with Chad Slade to win the inaugural Commuterlite one hour race. The St. George Motorcycle Clubs Invitational Event on the 9th. Feb. 2013 at the South Circuit was a Huge Success for Bucket Racers. 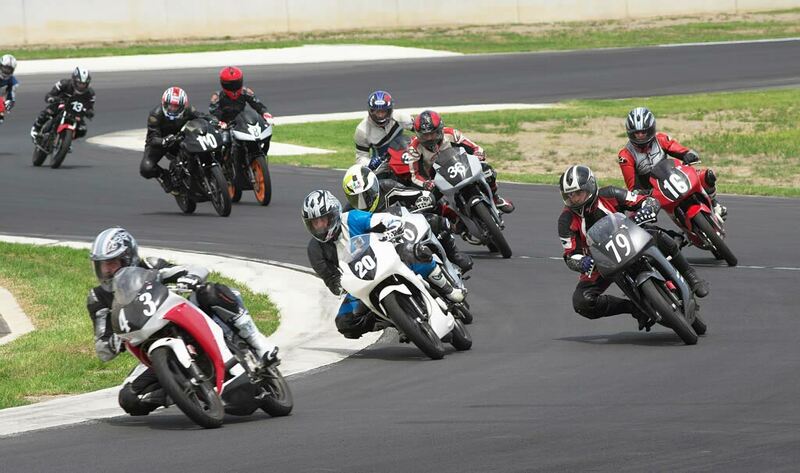 The Saturday race meeting open to PCRA and BRA members who race Motolite, Superlite and Commuterlite Bucket race bikes proved very successful and popular with the riders. 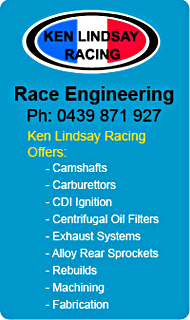 It was held at the South Circuit at Sydney Motorsport Park. 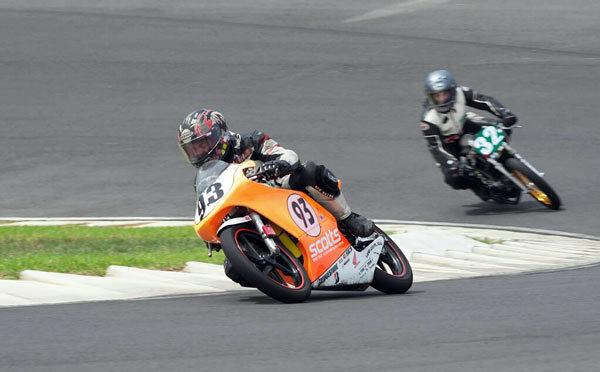 Thirty Bucket Riders availed of the opportunity to have an early season race thanks to the St. George Motorcycle Club including Motolites, Superlites and Commuterlites in the entry list. Paul Borg 93. was in scintillating form and won the day but had to contend with strong challenges from Damien Coppola (7.9) and Jason Hall (111). 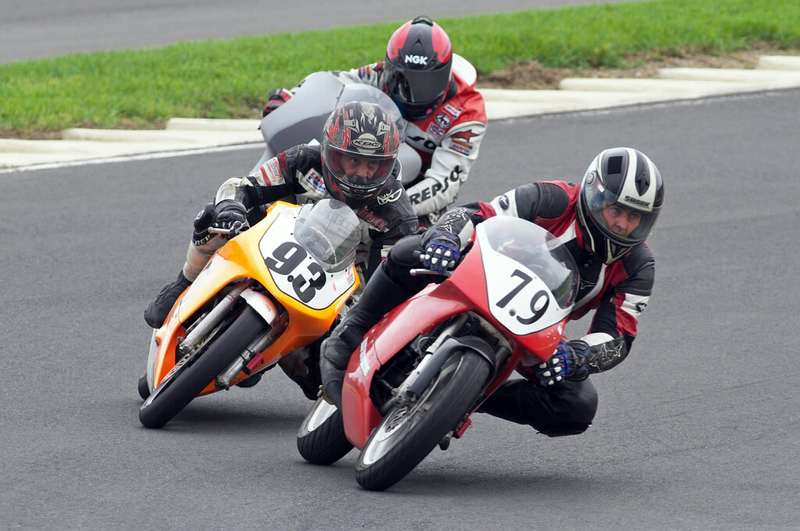 While these 3 were enjoying their own battle another was going on with the next group with Stephen Kairl riding the wheels off the new 150cc Supermono bike against returned racer Raymond Perez (Supermono 197cc.) These 2 put on a great show passing and re-passing. In the first race Raymond got the hole shot with the Supermono and led for a lap until Paul Borg took command followed by Justin Hall and Damien Coppola all on GP RS machines. What a great start for the recently homologated Supermonos, several of the new bikes were entered. After 4 races Stephen Kairl finished 2nd overall behind the flying Paul Borg. Damien Coppola and Jason Hall both had a DNF which killed their chances for a shot at winning. With only 4 bikes on the grid things didn't look too good but Tim and John put on a fine display of close racing with Tim taking out the win. Tim and John had 2 wins each but John DNF'd in the final race losing the chance for a win and handing 2nd place overall to Jim Murphy. Newcomer Michael Child had an enjoyable introduction to bucket racing. As is becoming the norm the Commuterlite riders put on a great display of close hard racing. North Coast racer Dan May proved too good for the locals being both fast and consistent. 2012 Commuterlite champ Ryan Young had a shocking start in the second race which cost him any chance of a win. The fast improving Ron Pulido put in some of the fastest laps ever on a Commuterlite around the South circuit and finished an excellent 3rd overall. Down through the field the racing was fast and furious with young and old enjoying real cut and thrust racing. 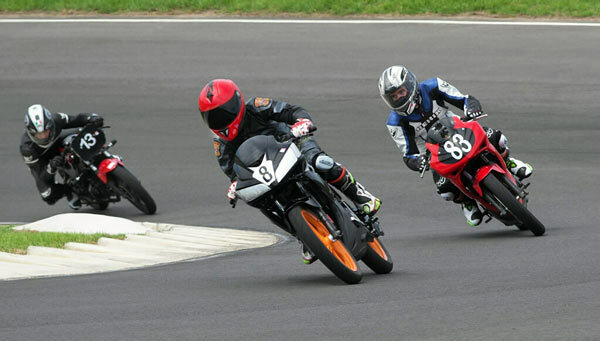 Newcomers Edward Marsden, Jack Robinson and Rez Pulido had there own battle with Edward coming out on top on that one. The whole field consisted of the almost unbreakable Honda CBR125s. This class just keeps getting better, the standard of racing and turn out of the bikes is a credit to the competitors involved. Jack Robinson #8, Edward Marsden #83 and Rez Pulido enjoying their first outing on Commuterlites. Current Motolite Champion #93 Paul Borg Honda RS85cr was in devastating form continuing his winning form from last year. Paul won 3 out of 4 races to take another fine win. #32 Raymond Perez on the Supermono 197 pushing hard to keep up.